Once again, Jujube proves to me that their cocktail list is second to none in the Triangle. 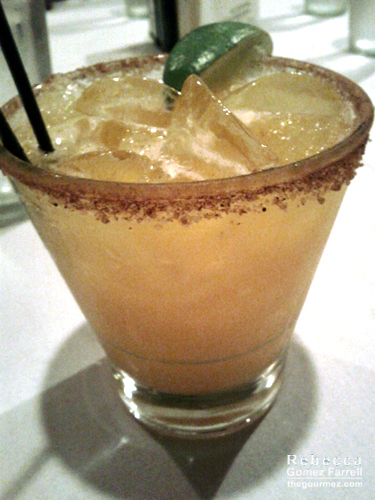 Bangkok Fever’s ingredient list is Thai-chili-infused reposado tequila, passion fruit juice, and cinnamon salt. And it’s amazing. The essential cinnamon salt livens up every sip, playing with the spice and sweetness. Don’t be deterred by how thick the rim is—the cinnamon is never overwhelming and it has an earthier role in this than it typically does in a cocktail. I love passion fruit, and you all know I adore heat in my drink. The chili provides a moderate kick, but I’d imagine most folks would find it pretty darn spicy. The tequila’s punch is perfectly balanced with the rest of the ingredients. I must say you have done a awesome jjob with this.